Enlarge / An artist’s representation of a Cas9 protein immediately interrupting and changing a living creature’s genes. Enlarge / They saw a very peculiar pattern. The film seems to know this about itself, as its ending credits list each participating scientist and talking head in order of appearance, all identified with one weird or humanizing quote. It’s as close as I’ve seen to a documentary ending with its own yearbook page, but Human Nature earns it. 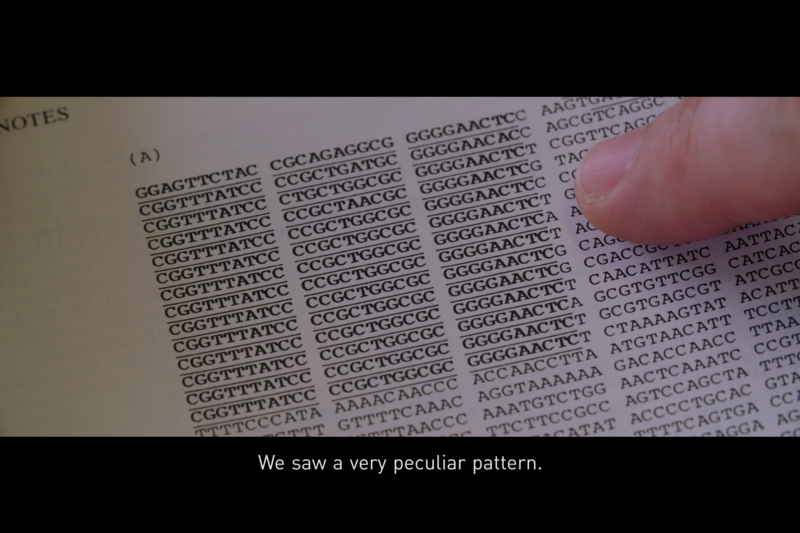 Before getting there, of course, the film has to set the stage by describing what the heck CRISPR is and why it has so much of the scientific community fascinated, excited, and/or terrified. The film opens in 1966 with a speech from Robert Sinsheimer, a biologist at the California Institute of Technology, in which he sums up his era’s understanding of the human genome. “We will come to the time when man will be able to alter his own genes,” he declares, and we hop-skip-jump through time to that very point. The film highlights one critical, difficult moment between the description of individual genes that started in the early 1970s and the modern understanding of gene editing: early gene therapy, which was described as an “essentially random process.” One French research trial in 2002 targeted leukemia patients who’d run out of feasible treatment options. But enough of the trial members suffered thanks to the uncontrollable, random nature of where the gene therapy DNA was inserted. The resulting cases of cancer ground the trial to a halt. But Mojica figured out a brand-new reason for the repeats: the repetition wasn’t junk. The sequence matched up perfectly with viruses that had previously infected the bacteria. And as Fyodor Urnov, one of the film’s most likable sources, explains, the reason is that something in the bacteria is acting like a “word processor for DNA.” After identifying a line of DNA that matches an invading virus, the cell copies that sequence into RNA. My Ars colleagues have detailed the work that followed. Labs have figured out how to supply specific genetic information to Cas9 proteins that can then go through an organism’s cells and snip specific information out of their DNA. Human Nature doesn’t offer nearly as comprehensive a look at all the trial and error that followed as researchers developed this process. The film’s animated sequences and friendly voices simply make a basic and clear case for why this method of gene therapy is indeed feasible. From there, of course, Human Nature takes us to the scariest extremes of what could follow. That includes requisite footage of Vladimir Putin at a Russian science event describing what future CRISPR-driven gene editing might look like. After talking up the wholesome angle of medical care and eradicating diseases, he adds a pretty on-brand suggestion: “This could be for a soldier” to “fight without fear or pain.” His speech is followed by images of Aldous Huxley’s likeness and passages from his 1932 novel Brave New World. “Every five years, we hear these horror stories,” one of Human Nature‘s researcher points out, asking viewers to belay their fear of the worst in terms of CRISPR ushering in a wave of eugenics. As one way to remind viewers that CRISPR could solve some real medical problems, the film tells the stories of a teen boy with a “milder” form of sickle cell anemia and a teen girl with severe myopia as brought on by albinism. In both cases, the affected kids and parents remark upon the possibilities of those diseases having never emerged… and then offered their own shoulder shrug. “I learned patience,” the boy with sickle cell says about his disease. “I learned to be positive. I wouldn’t be me if I didn’t have sickle cell.” This is followed by an explanation that sickle cell’s prevalence in sub-Saharan Africa is a likely evolutionary reaction to the region’s scourge of malaria, as sickle-cell sufferers aren’t as likely to contract that disease. Human Nature is careful to let advocates for every talking point get their fair share of screen time. A CRISPR-obsessed researcher named Stephen Hsu talks up his hopes for increased human intelligence as a result of wider access to gene editing. Other speakers opine, well, what metric of intelligence are we even talking about? Another gene-editing researcher, George Church, admits that his stated goal of resurrecting the woolly mammoth via the practice is “quixotic” but is positioned as a reminder that his work could apply to work on other endangered or declining animal and plant populations. But that simple statement could itself weave its own web of an entire two-hour film: what might the scientific community believe is the best practice to preserve coral reefs by way of gene editing? Or bee populations? Or deciding which genetic conditions should be snipped out of people, either via “tissue line” applications (to mature cells, thus not affecting embryos) or “germ line” (meaning straight to the embryo and affecting future generations)? The last point—researchers’ stance on germ-line gene editing—gets the most airtime in this documentary. This mostly reveals an evolving stance, from hard-line “nope nope nope” to a growing willingness to address serious genetic disorders at the embryo level. For the most part, however, Human Nature is a film about human history and ambition, not the research community’s exact next steps. We see wide-eyed researchers trumpet their highest-level hopes or express fatigue with doubters. We see affected families talk about what illnesses they want eradicated forever or what illnesses might actually define the human condition. We see archaeologists and agriculturalists remind viewers that humanity already has a rich tradition of “gene editing” by way of artificial selection, via what we choose to plant, how we domesticate animals, and more. There’s just enough data in Human Nature—really, right on the edge of an information deficit—to make a case to casual viewers. As one of this site’s science novices, I admit that the film had me eager to hit up my colleagues’ articles and join the conversation. We’re potentially on the brink of wider CRISPR-driven gene editing in humans and other mammals (including a startup that wants to harvest human-compatible organs from gene-edited pigs), and the film made me hungry for more context—but it included enough smart commentators to respect my inherent skepticism. Is this the future of health? The future of a Putin-fueled super-soldier nightmare? By anchoring both of those extremes with a funny, human touch, Human Nature made me feel comfortable with a landing point somewhere closer to the middle. Human Nature received its world premiere screening at SXSW 2019. The film does not yet have a distribution deal in the United States.